The Lord Nelson Inn is a small, family run Inn on the Nottinghamshire/Lincolnshire border; our aim is to meet the needs of our guests and ensure that their stay is a pleasant and comfortable one. The following is a statement of our provision. Please do not hesitate to contact us on the above number, if you have any specific questions or requirements. ● We are located on Main Road, Besthorpe on the main A1133 Gainsborough Road. Newark-on-Trent is approximately eight miles and the historic city of Lincoln approximately ten miles. ● The nearest bus stop is approximately 100 yards from the Inn and there is a local bus service which runs into Newark. A time table is available on request. ● The nearest train station is situated at Collingham approximately two and a half miles distance, with further stations in Newark and Lincoln. ● There are several taxi companies in Newark which serve this area; we are happy to provide details if required. ● Pictures of our rooms and a copy of our menu are available on our website. ● Our website and e-mail address is detailed below. ● There is ample car parking which is accessed through double gates. Gates are opened early morning and closed for security at closing time. However, if guests are making an early start or arriving after closing, we will ensure that the gates remain open. ● Our car park surface is level and surfaced with tarmac / gravel. ● We are happy to assist our guests with luggage, if required. ● All guests will be required to complete a registration form on arrival. ● The main entrance for guests is situated via the car park and is level and flat. ● Our doors remain locked throughout the day until 6.00 pm Monday to Saturday and 12 – 3.30 and 7.00 pm until close on Sunday. There is a doorbell situated on the main door entrance, if we are closed please ring when we will facilitate entry. ● On entry into the inn there is a long corridor which has a short pile carpet. ● Only well behaved pets are allowed into the building and must remain on a lead during their stay (assistance dogs are welcome). ● Access can be gained into our restaurant via a wheelchair. Please advise when booking a table in our restaurant as we can allocate specific tables for wheelchair users. ● Our main entrance corridor has a very short pile carpet. Areas within the bar and restaurant are carpeted or tiled; the toilets have a quarry tile floor. ● Access to all our bedrooms are via a double dog leg staircase with supporting handrail. There are four steps to the first dog leg which turns to the left; a further nine straight steps lead to the second dog leg which turns to the right with a further two steps to main landing which leads to accommodation. In general, the steps are 20cm high and 24cm deep with width ranging from 84cm to 94cm. ● The main landing has a single step leading to room 3 (single): 15 cm high, 76 cm wide. ● Our toilets are situated off the main entrance corridor; however they are not wheelchair-accessible. ● All guest bedrooms are en suite. ● Our bars are open Monday to Saturday 6.00 pm until 11.00pm and Sunday 12 noon until 3.30 pm and 7.00 pm until 10.30pm. ● Our restaurant serves food 6.30 pm – 9.00 pm Monday to Saturday inclusive and 12.30 – 2.30 and 7.00 pm until 9.00 pm Sunday. ● Tables have under space of 75 cm; chairs can be moved to accommodate specific needs. ● We hold a PRS certificate and a PPL and play background music in our main bar and restaurant. ● We pride ourselves on our custom built smoking area which has light and heater. This is situated adjacent to the main entrance to the building. ● There is a beer garden with lawn and flower borders and seating for approximately 30 people. There is a small (10cm) ramp/step onto the lawn. ● We have ample lighting in our car park. The car park is lit from 6.00 pm until close. ● We have an outdoor skittle alley housed within a pagoda style structure. ● We have two double bedrooms situated on the first floor,all are en-suite. ● Double beds are 60cm high. ● Large mirror, chair, wardrobe, bedside cabinets and table with tea making facilities are provided in the room. ● Furniture is movable on request. ● Iron and ironing board are available on request. ● Our comfortable, modern en-suite bathrooms have large shower cubicle, toilet, wash hand basin and heated towel rail. ● Complimentary toiletries are provided. ● Plain-coloured fitted short-pile carpet to the floor. ● Guests are provided with a key to an outside door enabling access to rooms at all times. Access to this door is over gravel with a small step into the building. ● All en-suites have tiled floors. ● Wash basins are 80cm high. ● Toilet seats are 43cm high. ● The shower cubicle in room 1 (double) is 90x90cm and has a step of 14cm high and an edge of 6cm. ● The shower cubicle in room 2 (double)is 80x80cm and has a step of 23cm high and an edge of 5cm. ● Mobile phone reception can be restrictive in parts of the building. However, this can vary depending on networks. Generally reception is adequate within car park. ● Assistance dogs are allowed. ● We hold a full risk assessment. ● In case of fire guests are required to evacuate the building following fire evacuation procedure located on inside of bedroom doors. Please let us know on arrival if you require any assistance should the smoke alarms sound. ● We are a no smoking building. ● We hold a 4* Visit Britain accommodation award. 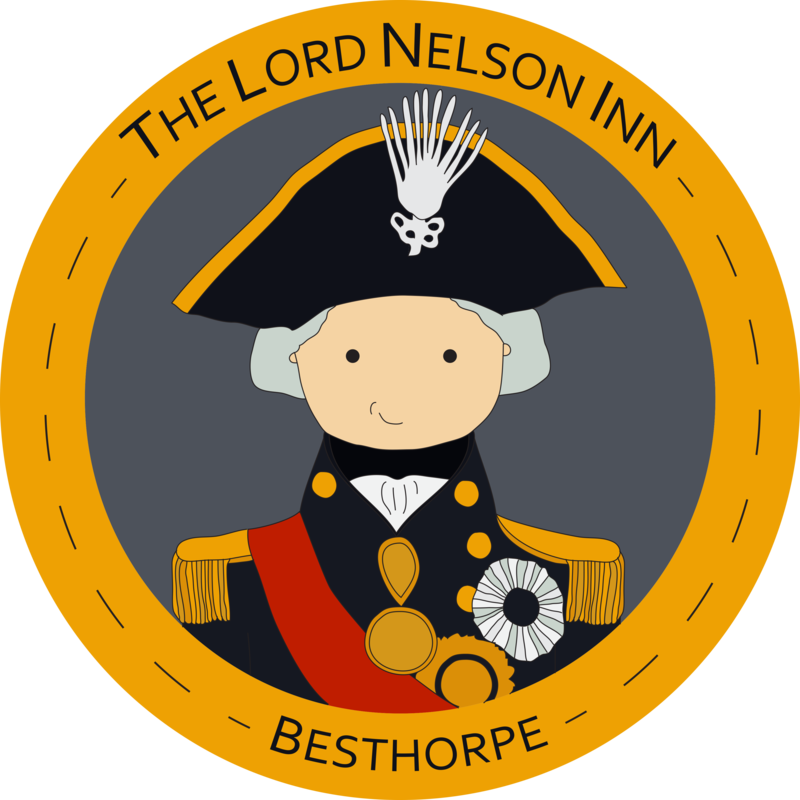 ● Address: The Lord Nelson Inn, Main Road, Besthorpe, Newark, Nottinghamshire NG23 7HR.